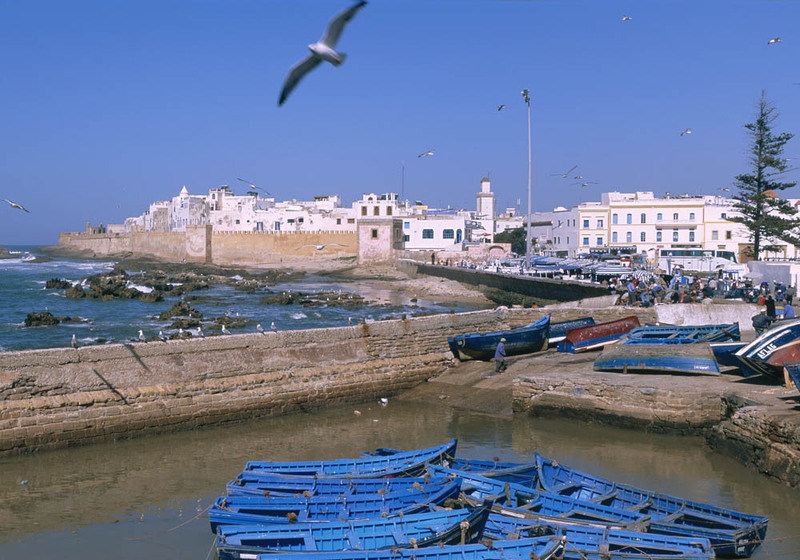 Essaouira is known as Morocco’s windy city. A combination of spectacular beaches, great sea and the almost constant tropical trade winds has changed this city from a hardworking port into one of the world’s greatest sites for windsurfing, kiteboarding and other exhilarating watersports. The city has a dual heritage and this can be seen in the mighty walls that surround this old Moroccan trade centre. Once a Portuguese fortress, rusting cannons between the ramparts still point out to sea, and there is a certain European feel to the construction of the city once known as Mogador. However, the narrow winding streets are filled with the sound of Gnaoua singing, women in white haiks weave their way through the alleys of the old medina, and palm trees cast their shadows across the walls of white-washed houses. At its heart Essaouira is, and always has been, a Moroccan city. The bustling city of Essaouira loves a good festival. Over the year it has events ranging from the traditional to the unexpected. 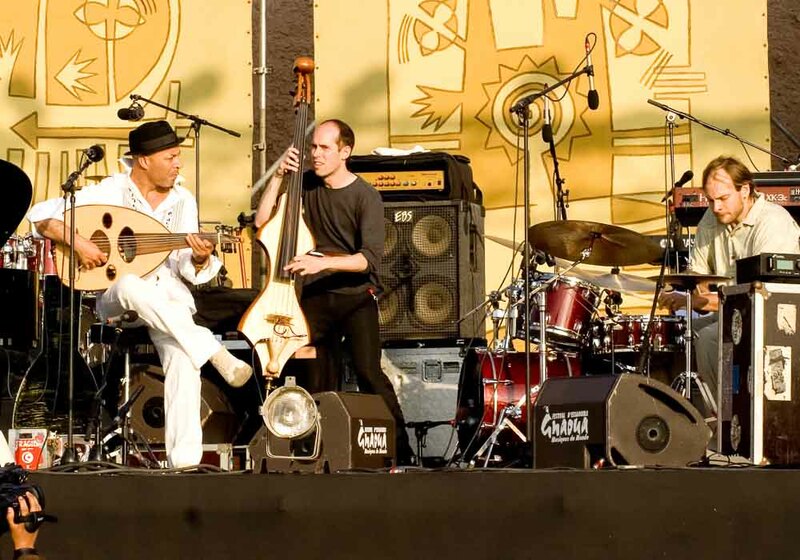 Les Alizes is a classical musical festival which takes place in the spring, the Atlantic Andalusia Music Festival brings together a diverse range of cultures and religions, and the world renowned Gnaoua and World Music Festival is dubbed ‘Morocco’s Answer to Woodstock’. There’s even a Women’s Hadra and Trance Music Festival to enjoy. 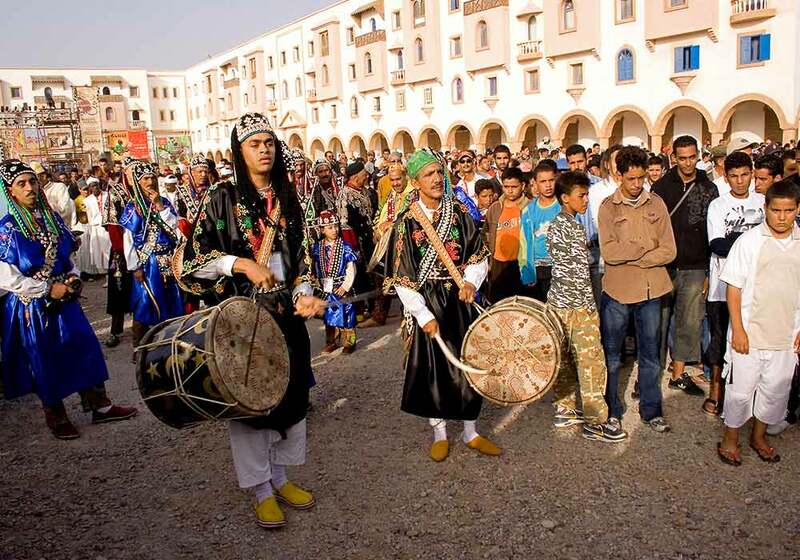 Like most Moroccan cities, Essaouira also has its own Moussem which is a religious festival. Every April the Mousem Regraga – a 39 day pilgrimage – is celebrated in the city with a festival of music, dance and art. 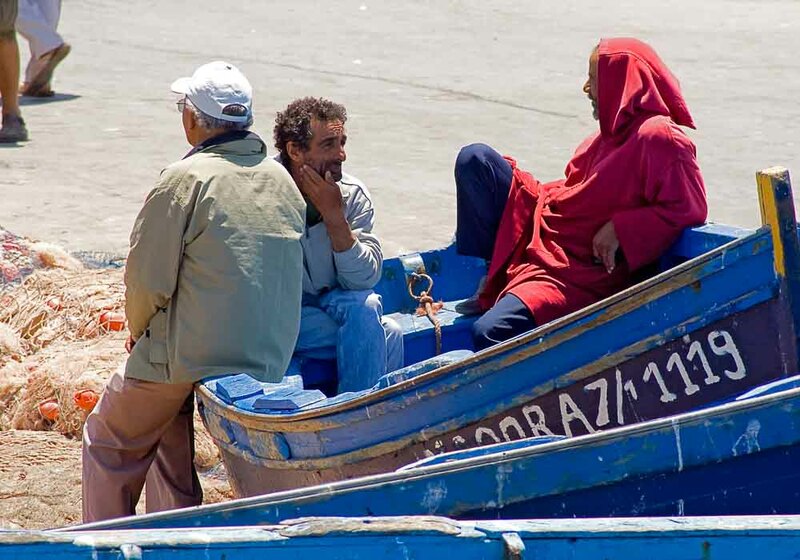 The culture of Essaouira reflects the city’s tumultuous history. For a long time it was a Portuguese enclave called Mogador, and this Mediterranean influence can be seen in a culture that is part European, part African and completely its own. One of the first places culture seekers should go is the Mogador Cultural Centre. Designed as a seagull flying over the town beach by Brazilian architect Oscar Niemeyer – described by the BBC as ‘one of the most innovative and daring architects of the last 60 years’, it’s home to regular musical and dramatic performances. 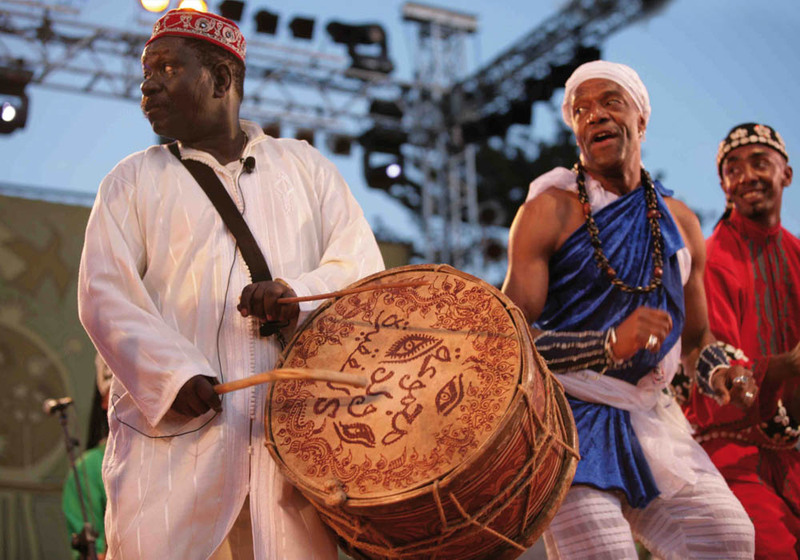 More music can be found at the Gnaoua festival which is held every June, and this special mix of Arab and sub-Saharan culture which combines music, dance and acrobatics is a spectacle you shouldn’t miss. Take to two wheels when you visit Essauoira and ride through winding alleys, picturesque squares and past whitewashed houses. 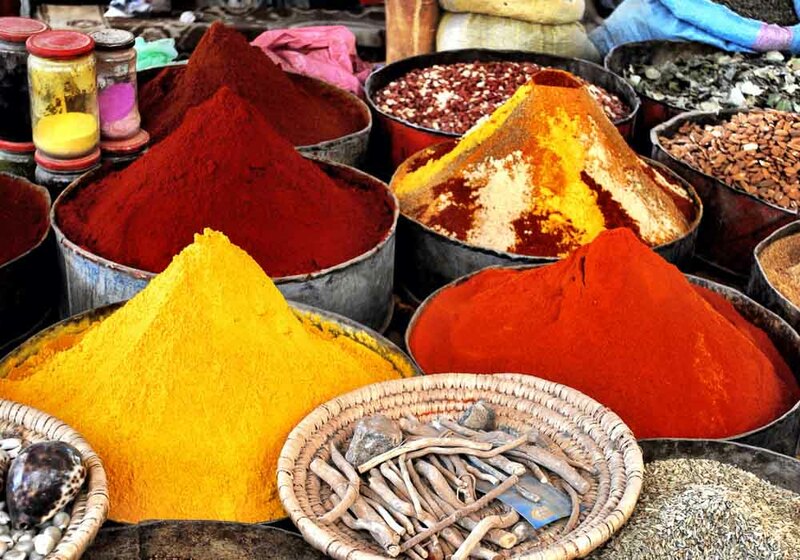 Africa’s ‘Windy City’ may resemble a French town on the outside, but is Moroccan to its heart, with sprawling souks, the aroma of spices and Gnaoua singing everywhere you go. When you decide to pedal outside the city you can cycle across the seven artificial lakes at the seaside resort, or head to Essaouira’s outskirts and ride on well worn paths shaded by lines of almond trees. 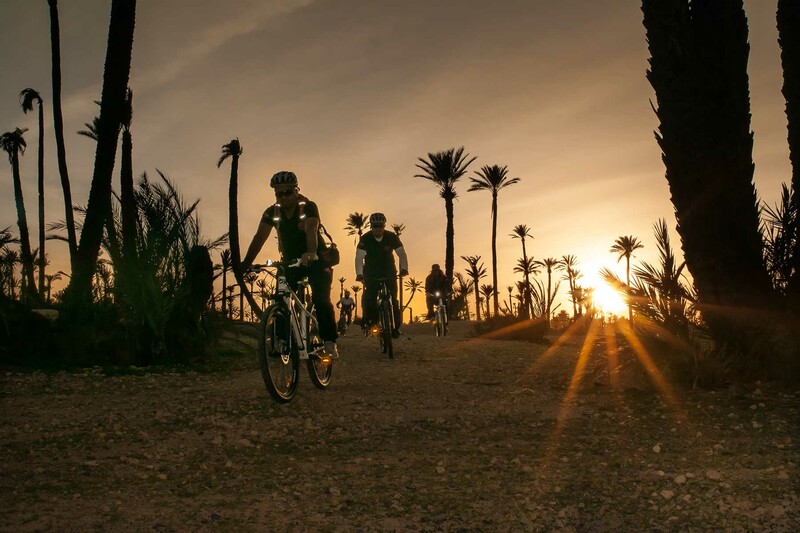 Mountain bikers aren’t left out either; the nearby Atlas mountains provide you with all the tracks you could need, and if you’re really feeling up for a challenge then take on Djebel Hadid: the Mountain of Iron. 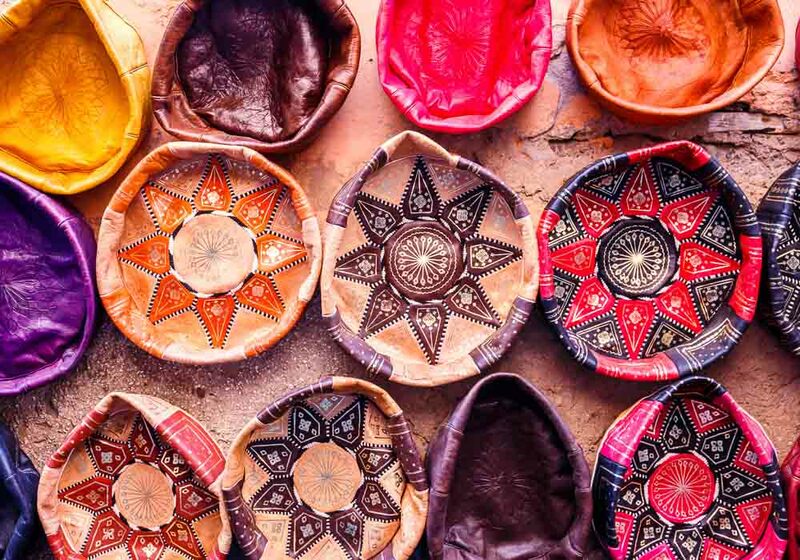 Morocco’s Windy City offers plenty of busy days out for your family to enjoy, whether it’s down by the sea, in the lively centre or exploring the city outskirts. 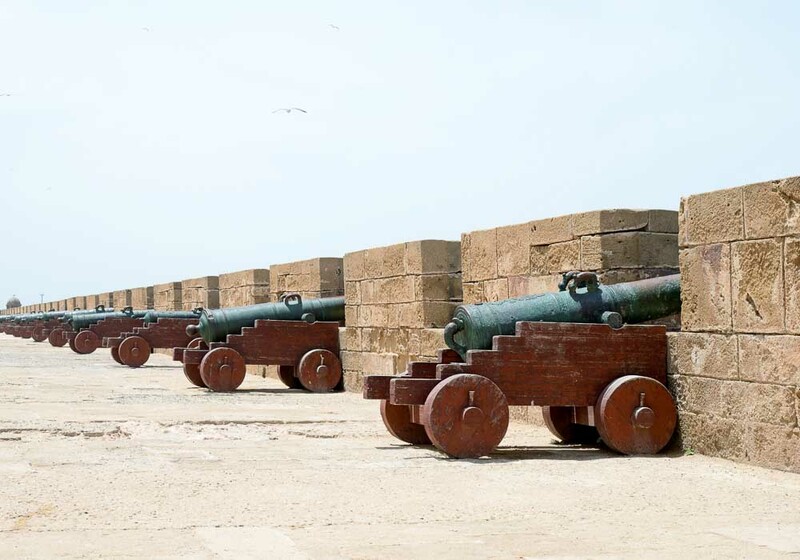 For a long time Essaouira was a fortified city, and children will love exploring the ramparts and abandoned cannons that can be found here. The beach is a launch point for kite surfers and wind surfers, as well as home to many cafés, often with their own play areas. 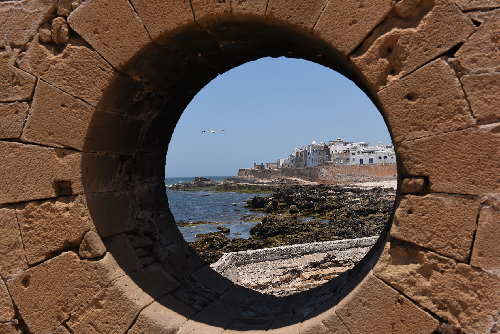 Essaouira’s Medina is comparatively calm, and full of delights for your family to discover. Adventure a little further out and you’ll find wonderful walks, horse treks and quad biking. 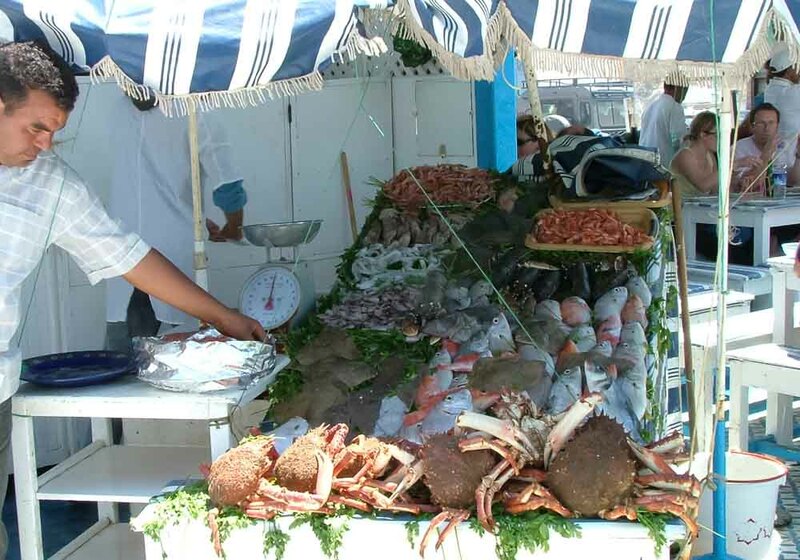 To get a real taste of authentic Essaouira you need to make your way to the port. Every day local fishermen haul in their catch and then arrange it in glistening displays of sardines, lobsters, sole and more fruits of the ocean. 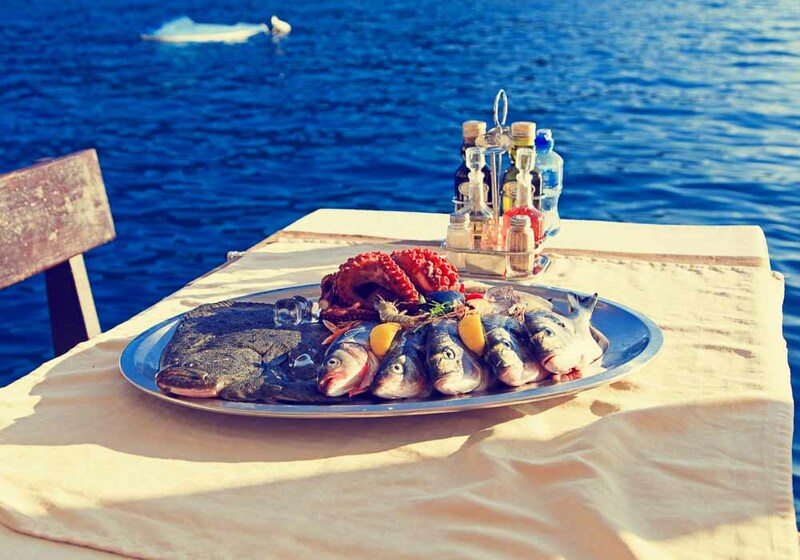 Simply choose what you’d like to eat, and the fisherman will grill it for you and serve it up for a small price. You can then sit at a simple table enjoying both the fish and the atmosphere. There are of course plenty of more formal restaurants in the Windy City – along the coastline where the windsurfers play, in the city centre, and also on the outskirts of the city including a restaurant run by the local vineyard. 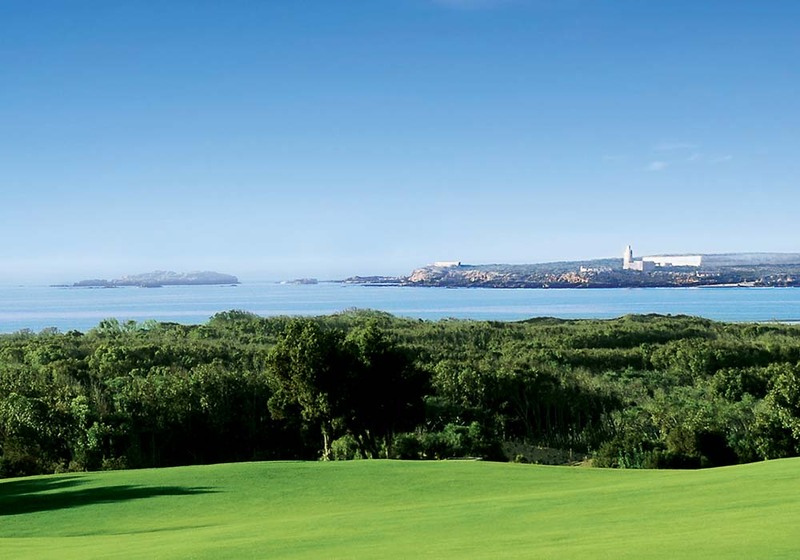 Essaouira is a city rightly famous for the excellent watersports it offers, but it’s also excellent for golfing holidays. Golf De Mogador (taking the old Portuguese name for the city) was designed by Gary Player and is a fantastic mix of British links and American desert style. The course expertly uses the area’s natural elements to create hazards – it’s the dunes you have to watch out for rather than bunkers – and the overall shape follows the line of the coast, giving you spectacular views across the Atlantic. In 2015 an extra 13 holes were opened, again designed by Gary Player. They’re narrower than the old course, with steeper hollows and some blind shots to test your skills. Golf World Magazine rated Mogador Golf Course as one of the world’s top 20 most exciting golf courses and it’s easy to see why. The hammams in the seaside city of Essaouira were traditionally used to refresh sailors after a long stint at sea, however they now welcome travellers and tourists in to rest and relax away from the famous winds of the city. 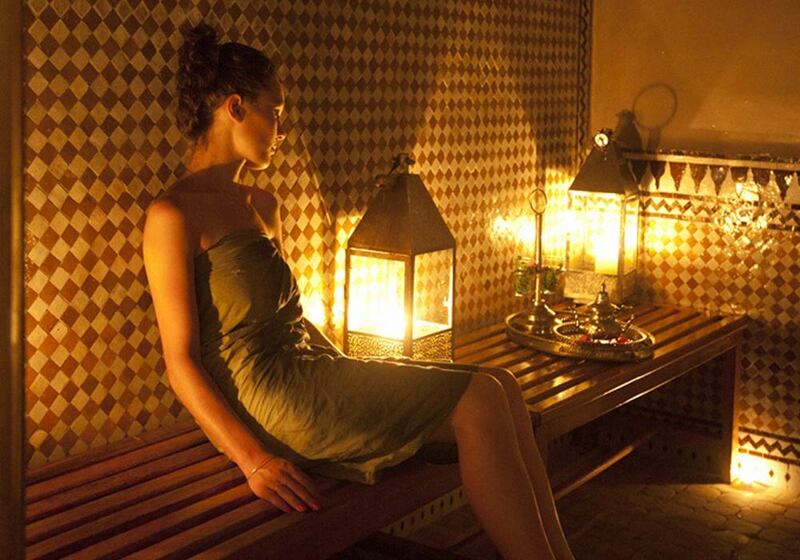 The deep steaming detox can revitalises salty sun-beaten skin and leave you refreshed and glowing. The traditional hammams can be easily found by following the streams of toiletry-laden locals or, alternatively, the larger hotels all accommodate luxurious hammams. Essaouira is now famed as one of the world’s best windsurfing destinations, but the road to its current status has been long and varied. The rugged fortifications that border the city speak of this seaport’s troubled past and the mix of European and Arabic architecture is the legacy of previous rulers. The best place to find examples of the city’s heritage is in the Medina. It is one of Morocco’s nine UNESCO World Heritage sites and if you step through one of the many gates in the old walls you’ll be transported back in time. Seek out the imposing kasbah with its nineteen bronze cannons, take in the ornate carvings on the doors and walls of every street, see the synagogues and church or visit the souk; it’s the best place for you to learn all about Essaouira’s heritage. 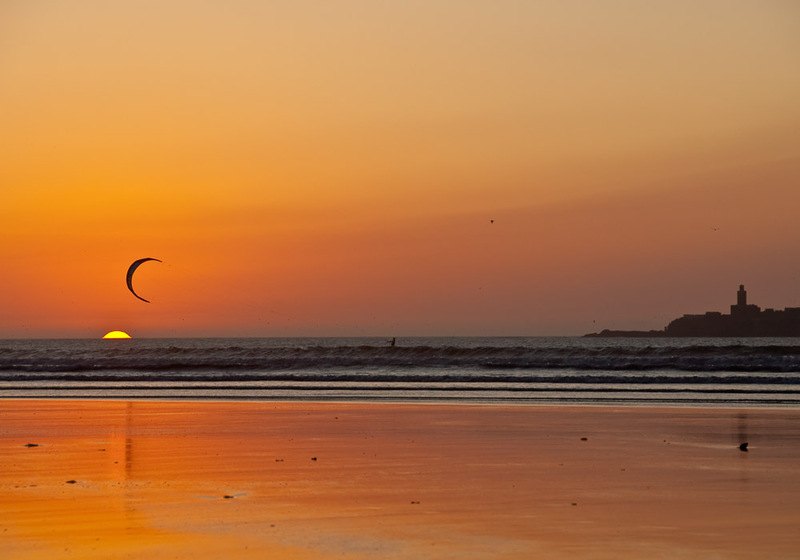 Image: Essaouira is one of the best kitesurfing resorts on the planet. 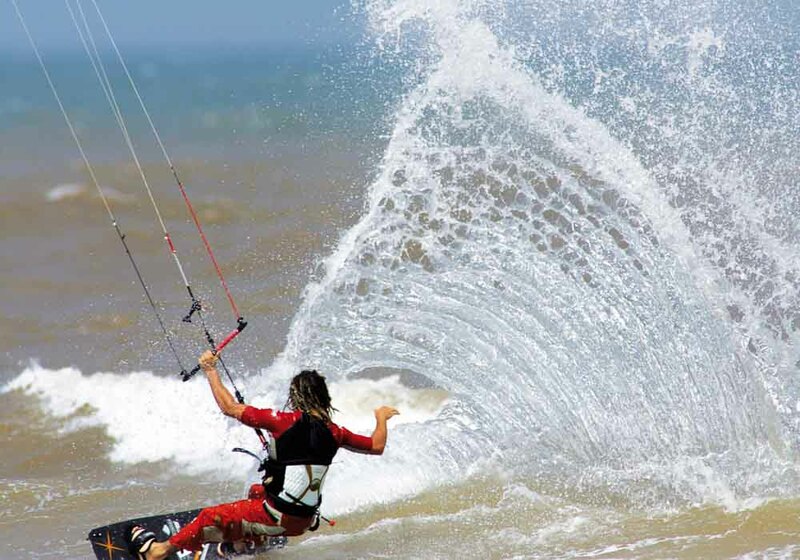 Eassaouira is the established kitesurfing capital of Morocco. Blessed with a perfect location on the Atlantic coast, Morocco’s windy city is world famous when it comes to kitesurfing and has hosted the World Cup on several occasions. The trade winds blowing from the North East and the Canary Current around Essaouira makes this the ideal place for kitesurfing. The consistent weather conditions provide the power you need to fill your kite and skim along the water. There’s also a huge beach, giving you plenty of room to set up your gear and launch. 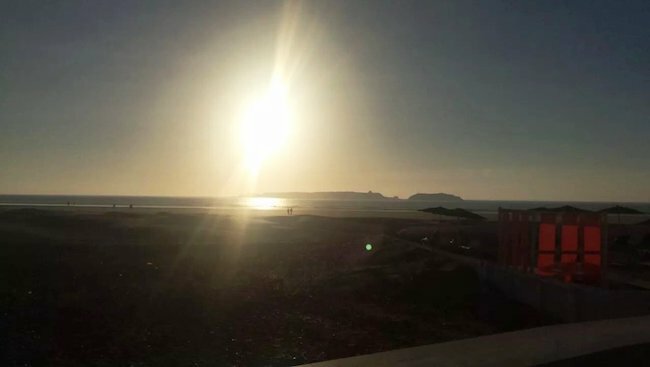 The locals haven’t been slow to make the most of Essaouira’s growing fame: a thriving industry has grown up around kitesurfing, so you’ll not be short of somewhere to take lessons or rent or buy equipment. Many kite schools will even arrange an entire holiday for you, including airport transfers from Marrakech or Agadir if you’re not flying direct from London Luton. While it may have been a bit of a hippy hangout in the 1960s, 21st century Essaouira is a town that can also offer you a higher class of stay. Good five star hotels are commonplace, and many riads have been upgraded, allowing you to enjoy their traditional Moroccan surroundings in the greatest of comfort. There’s still a calming atmosphere about the place, and this is enhanced by the numerous hammams and spas in the town, the vast beaches and predominantly white buildings which give Essaouira its nickname. 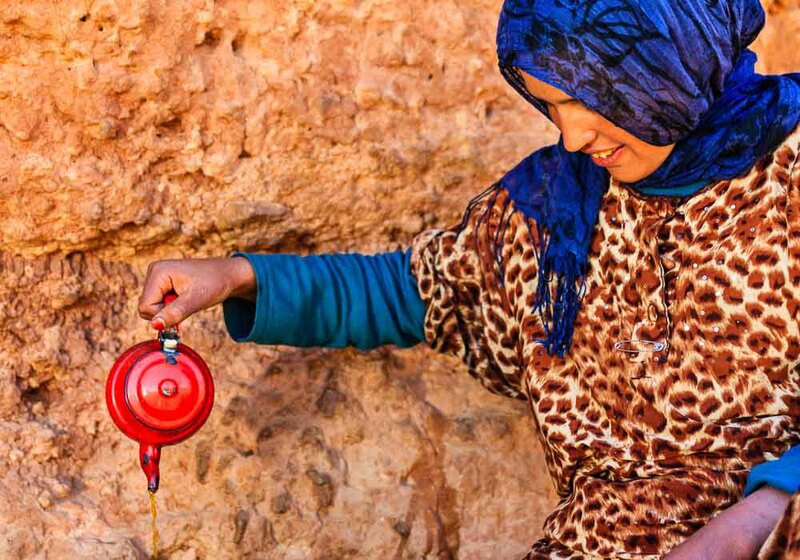 It’s an oasis of luxury in the Moroccan south-west. 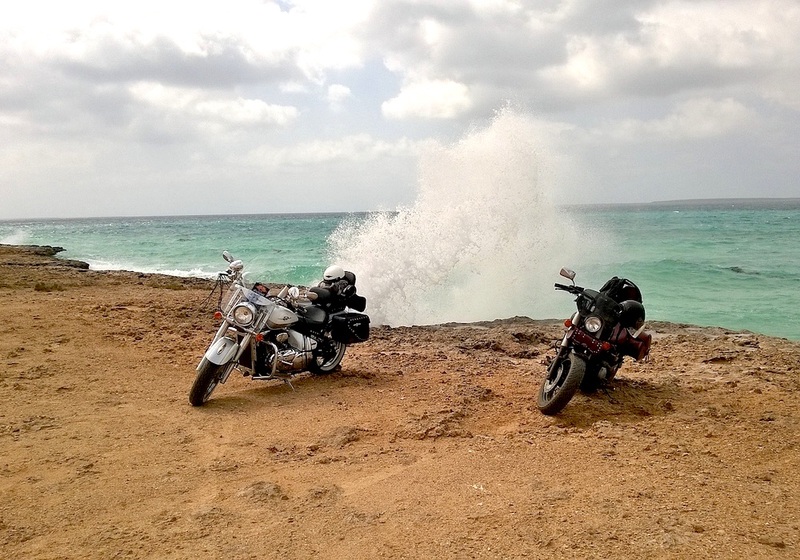 Essaouira is a fascinating part of Morocco to explore by motorbike. As well as the many treasures that exist inside this walled town there is plenty to see out and about in the surrounding area – and a motorbike is an ideal way to get to them. 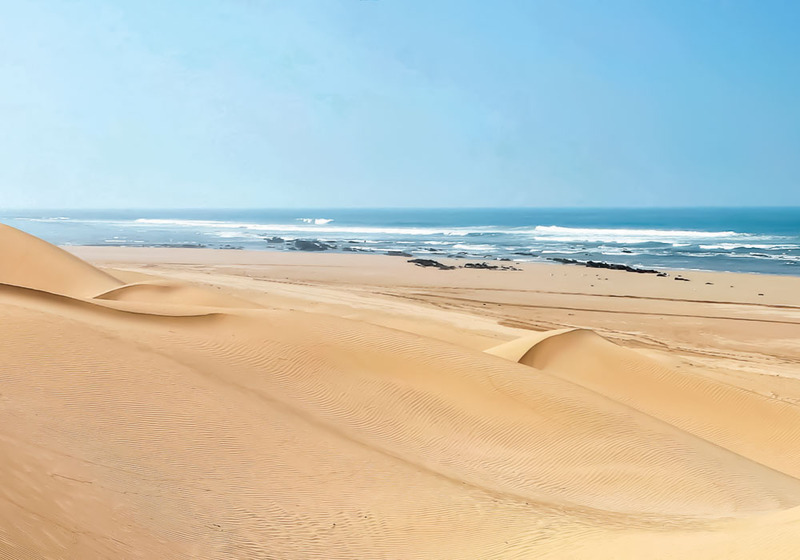 Ride north of the city and you’ll soon find some fantastic dunes which provide incredible off-road riding. 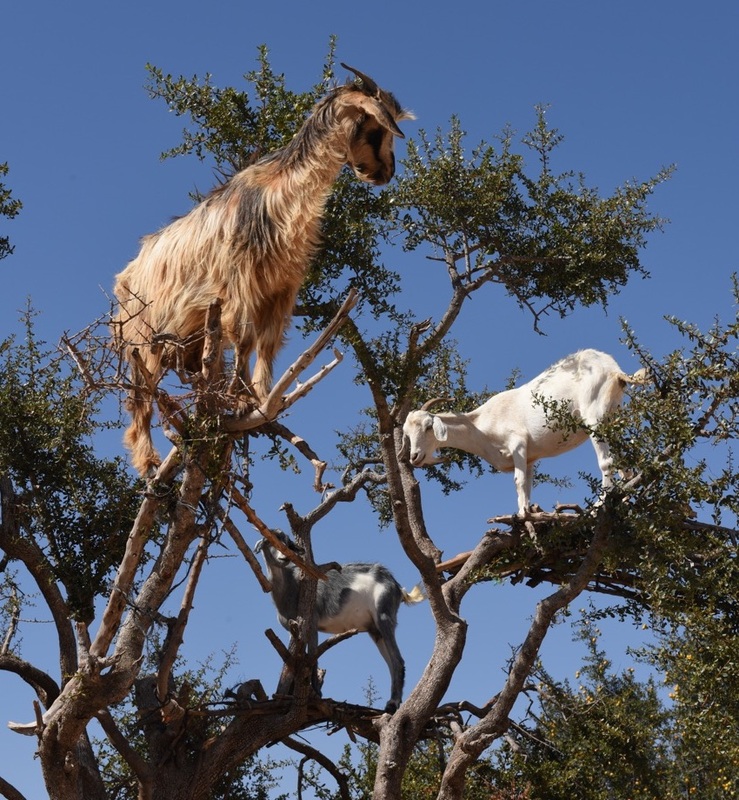 To the east are the mighty Atlas mountains, which are brilliant for both on- and off-roading, while taking the south road from Essaouira will take you through the rural communities and into the real heart of traditional Moroccan village life. 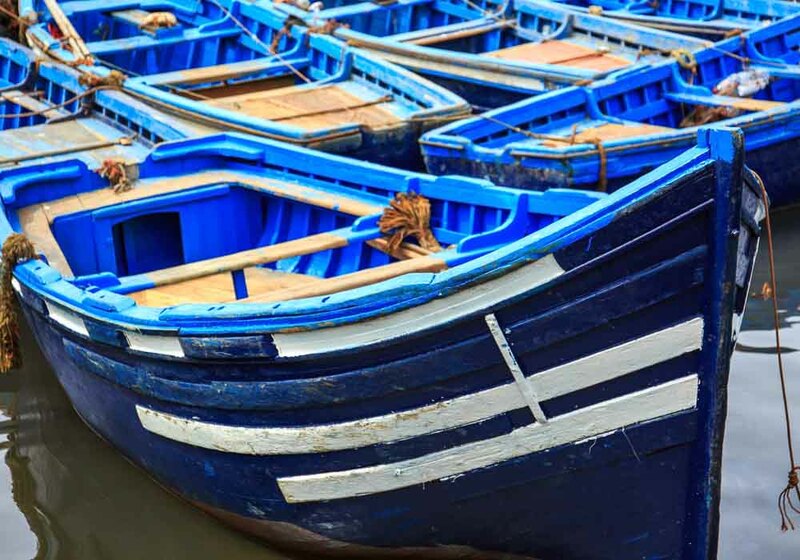 Essaouira’s natural harbour has made the area desirable for thousands of years and there have been people here since prehistoric times. Over the years it has been occupied by Amazighs, Carthaginians, Romans, Portuguese, Moroccan Jews, Arabs and French. As with many port cities, the people of Essaouira are used to visitors and holidaymakers will receive a warm welcome when they arrive. Weatherbeaten fishermen still push their boats out to sea every morning, but increasingly the city is focusing on tourism and as well as French, many Essaouirans speak English fluently. It’s a city that still has links to its Hippy Trail past, and is embracing the new kite-surfing culture that is growing every day. Essaouira is a resort famous throughout the world for the wind that gives it great windsurfing and kitesurfing. This does make surfing the waves here difficult at times, but the wind doesn’t blow all the time and most mornings and evenings the air is still enough to allow some lovely peaky barrels to roll in. The winter season is also a good time to visit; swell is noticeably larger and the beaches tend to be emptier. 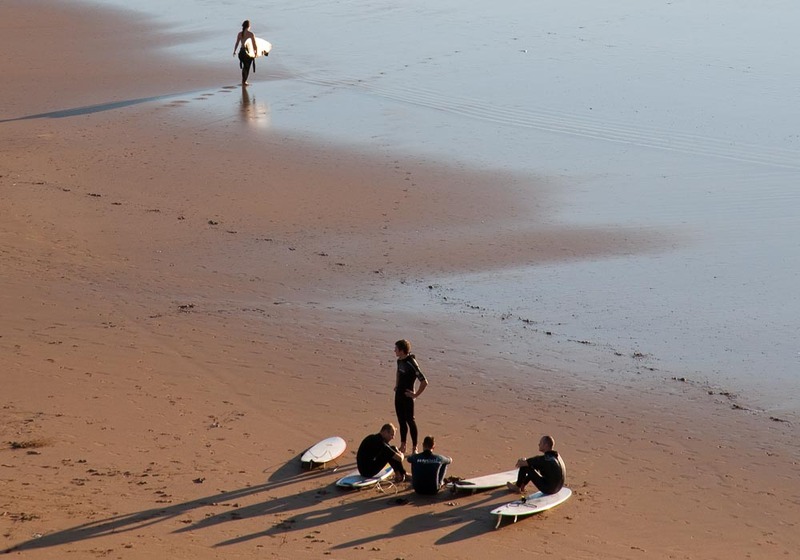 And don’t miss a trip to Sidi Kaouki, just a few miles along the coast – it’s Essaouira’s big surfing secret. Anyone looking for a trekking holiday on Morocco’s Atlantic Coast should strongly consider starting from Essaouira. A fine city in itself with plenty to explore, it’s also well positioned for people to visit the surrounding countryside. There are several Essaouiran companies who arrange guided tours in the area. 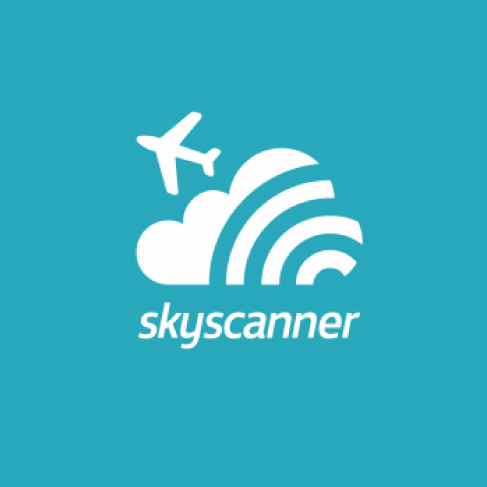 Their local knowledge is invaluable and you don’t have to worry about organising equipment, planning itineraries or finding out where to go. Instead, all you have to do is enjoy yourself as you encounter secluded sandy beaches and traditional Amazigh villages untouched by tourism. 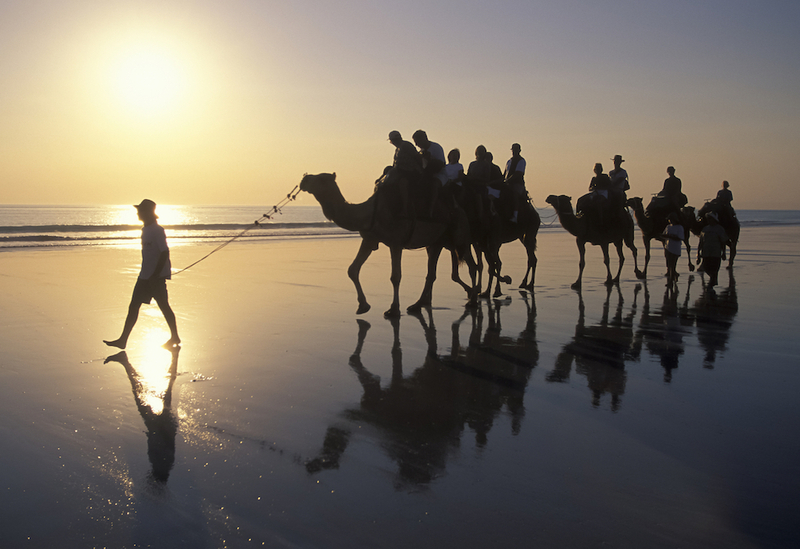 Whether you want to explore on foot or from the back of a camel, for as little as half a day to a whole week, there is something in Essaouira for you. 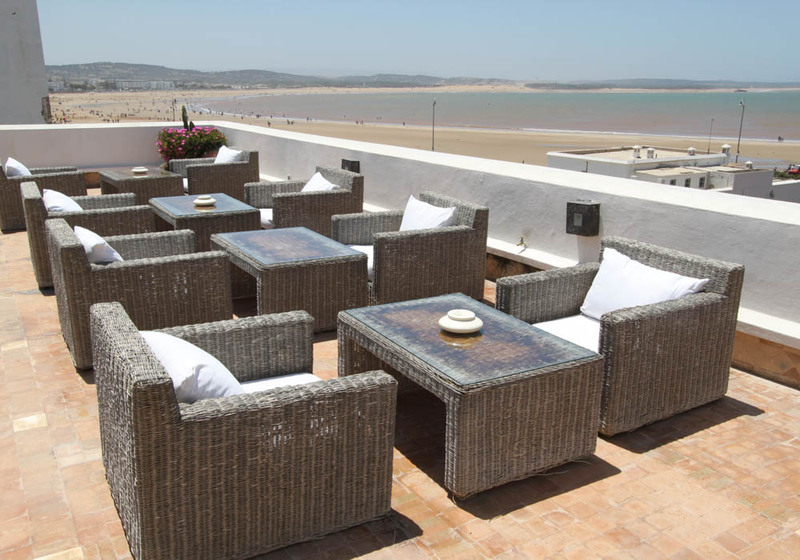 When you take a holiday in Essaouira you’ll have a wide choice of places to lay your head. 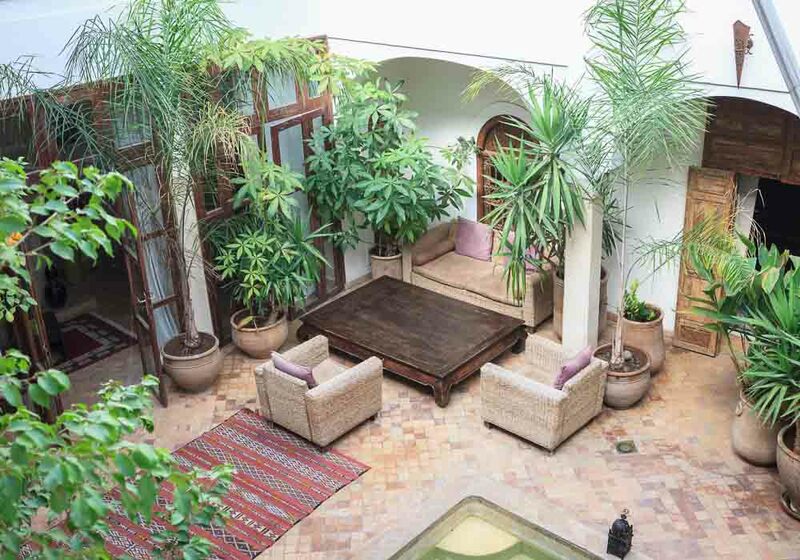 As with most Moroccan cities and towns, there are many traditional riads available to stay in. These range from cosy two bedroom places in the heart of the medina to opulent palaces with amazing views of the ocean. Alternatively you can always take a room in one of the many hotels that can be found throughout the city including a good selection of five-star accommodation. 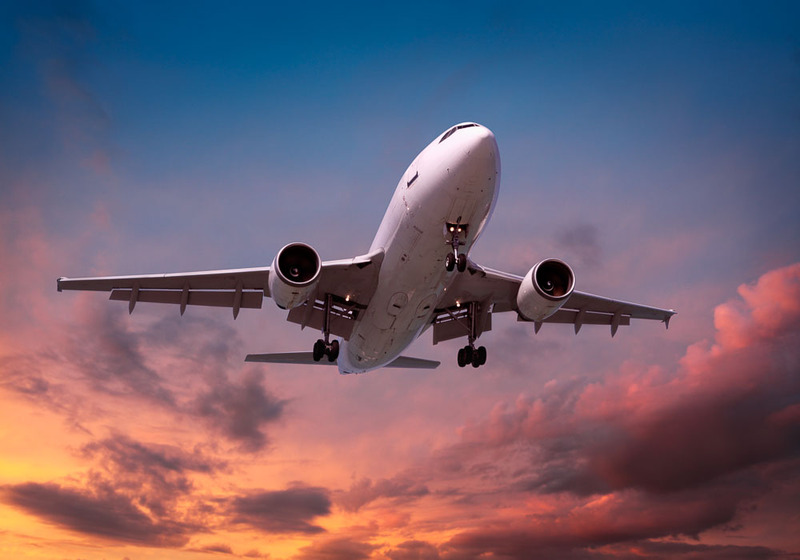 Flying to Essaouira from the UK has just got easier thanks to the opening of a new direct route between London Luton airport and Essaouira Mogador Airport. Before this most British travellers flew direct to Marrakech and travelled the rest of the way by road. If you still want to travel by land rather than air once in the country then Essaouira lies around two and a half hours drive from Marrakech and if you don't want to hire a car you can cover this distance by coach, bus, taxi or using the tourist transfer service. If you’re aiming to take a coach, it’s always best to book your tickets in advance to guarantee a place.